Vegetarian. Gluten-free. Easy to make. You need this mujadara recipe in your repertoire. One of my favorite friends shared this recipe with me years ago when we were both living in Ohio with no kids and busy husbands who rarely came home for dinner. She knew that I liked to cook a large batch of food that I could enjoy (all by myself…) throughout the week after getting home from teaching my middle school cherubs. Not only is this recipe healthy and good for you, it is also VERY budget friendly. A winner all around. Lentils, basmati rice, and a couple of onions cooked until they are crispy … I always cook extra onions because I like to eat them right out of the hot pan. 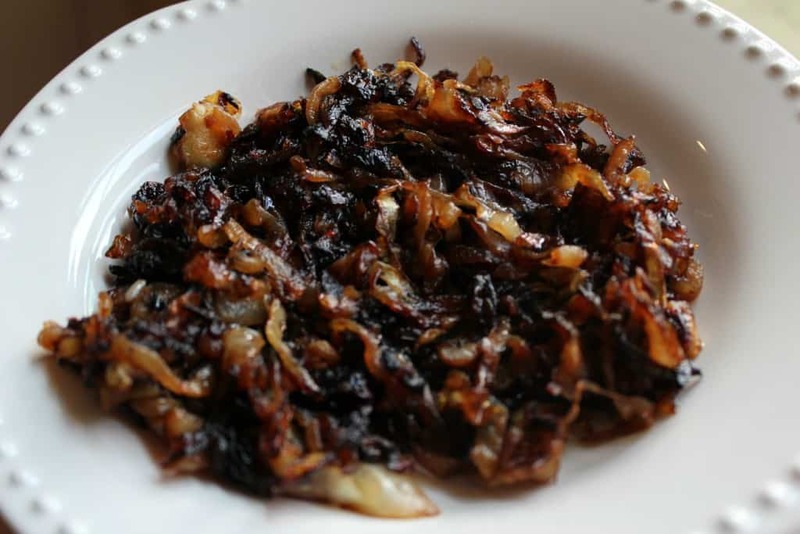 Don’t believe any recipe that tells you that you can caramelize onions in less than 20 minutes. Lies. It usually takes a solid 20 to 25 minutes to caramelize 2 to 3 onions when I cook. Caramelized Onions … Be patient! This mujadara recipe is perfect if you are feeding one or seven – this recipe even tastes better the next day. I am feeding too many people these days to have any leftovers, but don’t be wary of the large quantity of food this makes – this might be the best leftovers you’ve ever had. Now that my older kids like to help in the kitchen, they are responsible for preparing the Lebanese salata that goes on top. Don’t skip this step! 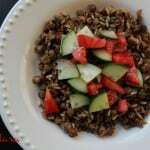 The cool, crisp salata is absolutely perfect on top of the warm lentils and rice. This vegetarian meal can feed a crowd and it is so easy to prepare! In a 3 quart saucepan, combine lentils, rice, broth, water, and cumin. Bring to a boil. Reduce heat to low and simmer covered until all the water has been absorbed and the rice and lentils are tender. Stir occasionally to make sure the lentils and rice are not sticking to the bottom of the pan. In a separate, heavy-bottomed pan, caramelize your sliced onions - stir and cook for at least twenty minutes until they are dark brown with some nice blackened bits on the edges. Add the cooked rice and lentils into the pan with the caramelized onions and stir to combine. Chop tomatoes, cucumbers, scallions, and parsley. Toss with olive oil, red wine vinegar and coarse sea salt. Top mujadara with salata. I ADORE mujadara–I confess I have never seen it with garam masala. Is that your own twist or have you ever seen it called for in a Middle Eastern recipe? I bet it is tasty either way! Hi Laura! I just love the flavors in Garam Masala – I have never seen anyone else use it in Mujadara but it definitely hits the mark! This is my kinda dish! I adore lentils and middle eastern cooking! Such a hearty and great meal, pinned! Thanks! This is definitely hearty – great as a meal or as a filling snack. I love this combination of flavors. On their own, lentils don’t taste like much, but in this recipe, I’ll bet they are wonderful. I have never made mujadara, but this is a recipe that sounds as though I should put in my rotation. Laura, I bet you would love this! What a great dish. 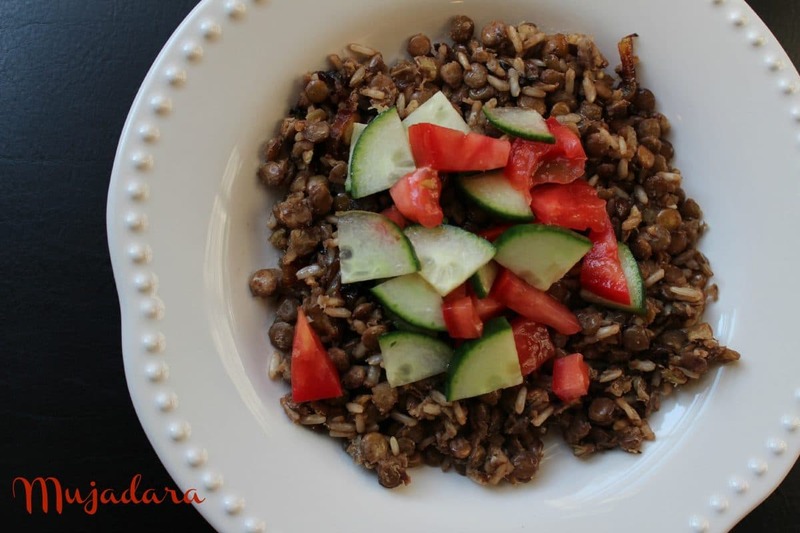 I love lentils but the thought of adding Lebanese Salata on top is perfect. This recipe is right up my alley! I love mujadara and make it regularly. What a wonderful idea to top it with the lebanese salata! Thanks!! 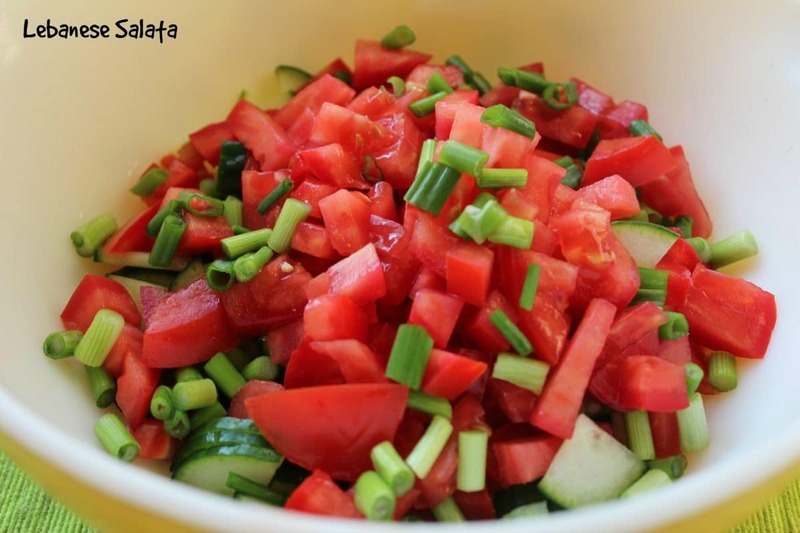 And the Lebanese Salata is so easy to make – it’s the perfect refreshing topper! This is a dish my family would love. My husband is from India. I would definitely add the garam masala too! Thanks! I really like it with the garam masala. Hope your family enjoys it!